STORY: Picturesque Dal Lake located in the heart of Indian Kashmir’s summer capital, Srinagar, played the backdrop for election campaigning for political leaders. President of regional National Conference party Farooq Abdullah Abdullah campaigned for the second phase of polls at the lake on Thursday (April 11). 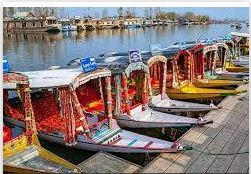 He is reportedly contesting from Srinagar-Budgam constituency and was greeted by scores of supporters at the lake who also rode along with him. Known as the ‘jewel of Kashmir’, the iconic lake is surrounded by snow-capped mountains and is home to about 2,000 ornately-carved pinewood houseboats. While speaking to media persons, Abdullah invited tourists to visit the lake, and described it as the “pride” of Kashmir.